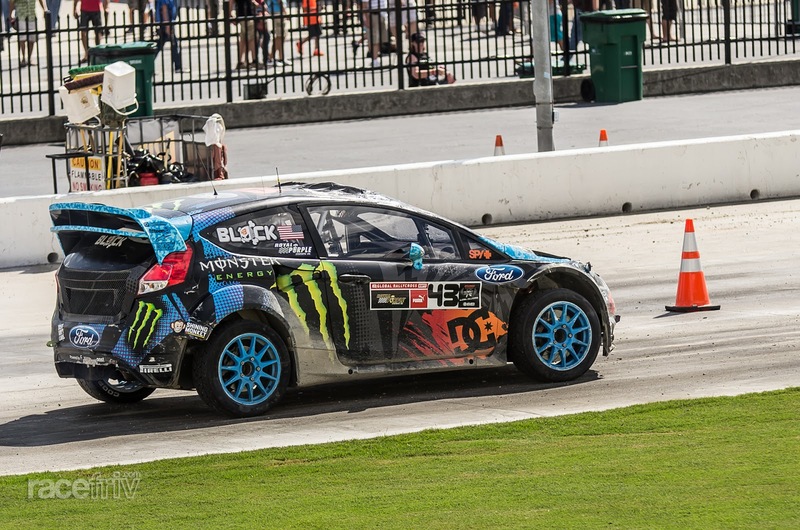 racefriv.com: Global Rallycross @ Atlanta Motor Speedway! 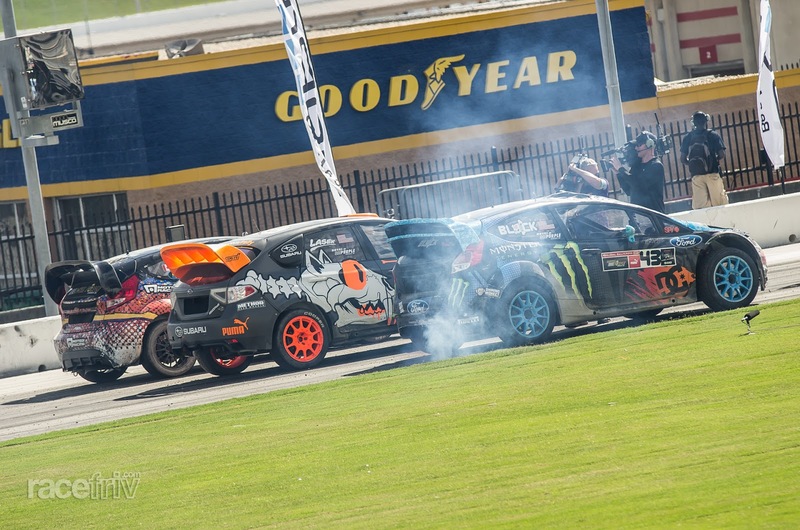 Global Rallycross @ Atlanta Motor Speedway! When I arrived the rest of the racefriv crew were enjoying the steamy weather in the parking lot and engaging in some bench racing. Its possible that they had already enjoyed some adult beverages too but sometimes they just act that way . (editors note:...we did). I decided to go and save a seat in the shade and get to the paddock to see what the teams were up to. Qualifying was already underway and I could tell that the jump was catching some drivers off guard. It was at the end of a long straight (part of the front straight of the full NASCAR track) and had only a slight chicane to slow them down for the jump. This made the entry speed pretty high and some drivers were going so high and far that they landed hard. It wasn't unusual for cars to destroy their front clip on lap 1 and have parts strewn all over the following corner for the rest of the race. I caught one of Kens jumps in a Heat. This gives you some idea of how the landings looked! Later heats saw the track modified with the chicane moved closer to the jump and made a little tighter to lower the entry speeds. 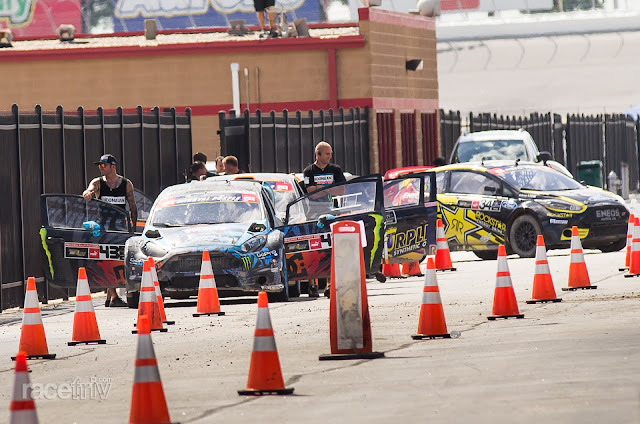 GRC racing consists of a series of heats to determine which cars make it to the final race. The top 2 cars of each heat will make it to the final. 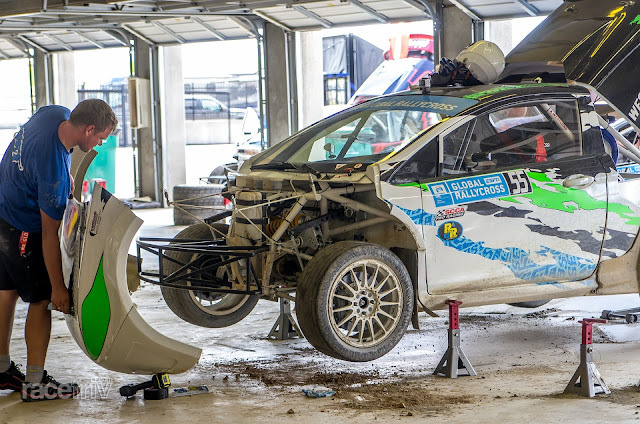 The format changes slightly depending on the number of entrants and the time they have available at the event but typically this consists of 3 heats (putting 6 cars into the final) and then one more heat called the last chance qualifier. the fastest 3 or 4 cars from the "LCQ" may go through to the final. Times determine grid position with rows 3 or 4 cars wide and the inside of the first corner being given to the "pole position" car. Heat winners also get bonus points for the championship. Ken Block's car was burning a little oil while he lined up for his heat. 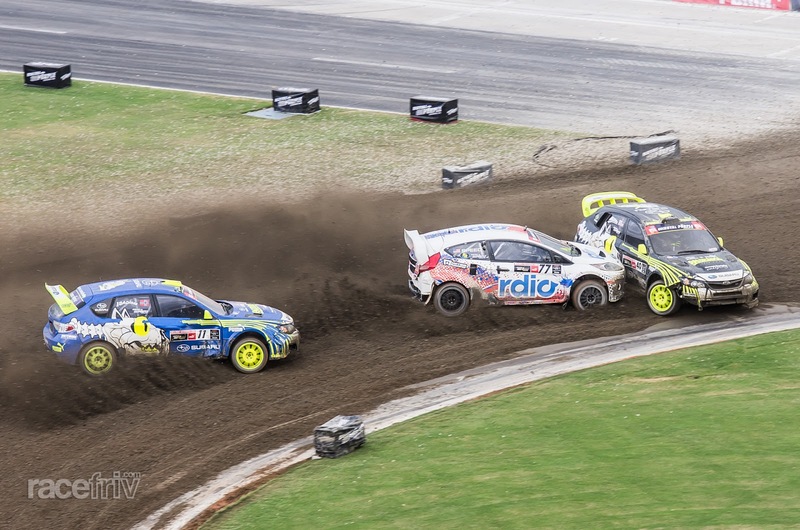 GRC has an entry level series called GRC "lites" where drivers compete in a single chassis spec class with sealed engines. 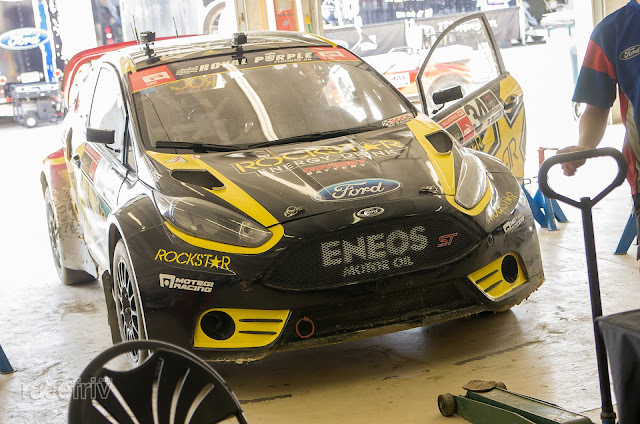 They have around 325hp (compared to the more than 500hp in the GRC "supercars") The racing in the "lites' was very close and in their Final the lead changed hands almost every lap of the race. The crowd went wild as US driver Mitch DeJon reeled in the Swede Sebastian Eriksson and passed him on the final corner of the final lap for a well deserved 2nd place. Mitch is only 16 years old! 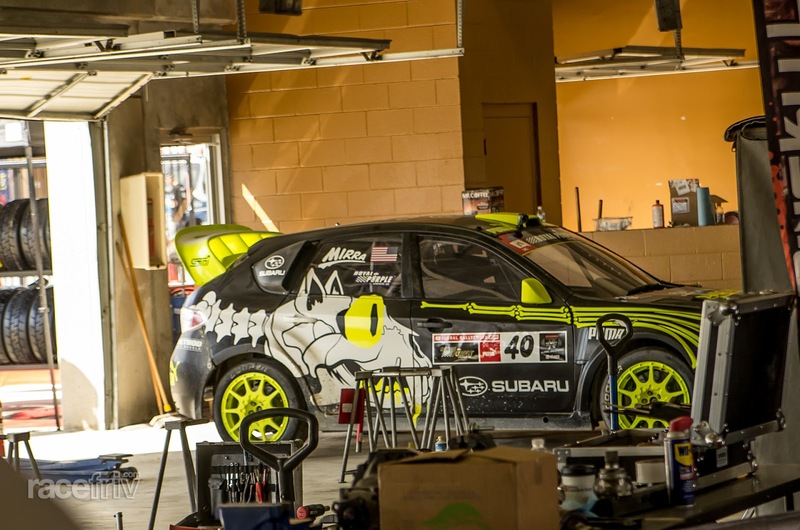 This is a GRC Lite car. Notice the tubular frame, the sealed spec engine is in the back. The track needed regular prep work because the cars threw the dirt off so easily. Late in a race the ruts could get very deep and some areas the track would be down to underlying pavement. 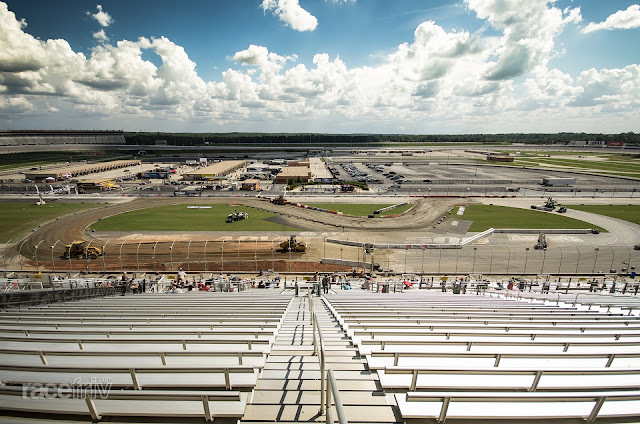 The jump in the foreground was taken from right to left, into that dirt right-hander and dirt S, then out onto the main asphalt straight off the right of the photo. Its hard to brake for a corner while flying through the air. The main straight had this nice shower set up to make life a little more interesting and to keep the dust down on the road asphalt part of the track. You could hear some cars spin all the wheels in 3rd gear, a couple of them even brushed the wall. 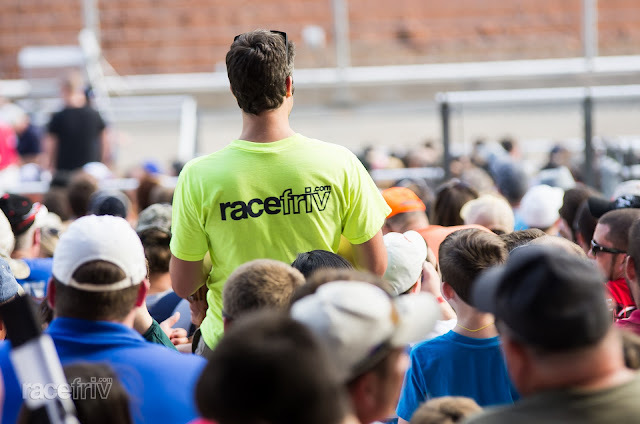 The weather cooperated for the race and by the evening had clouded over which helped cool things off. Ish was a true team player and wore his shirt. We didnt get total access to the garage, although Ish did sneak back there to mingle with the elite. I managed to get these shots of the cars being prepped. It just looks so tantalizing just sitting there with no one watching over it doesn't it? Bucky Lasek didn't make it to the final after a mechanical problem in the last chance qualifier. He looked pretty sad about it as you might imagine. At least he still has a bucket full of X games skateboard gold medals to fondle when he goes home. Bucky (above) wasnt the last person to have his car quit on the start line however - more on that below. The Names in the GRC supercar final were familiar to many, with a few absences. 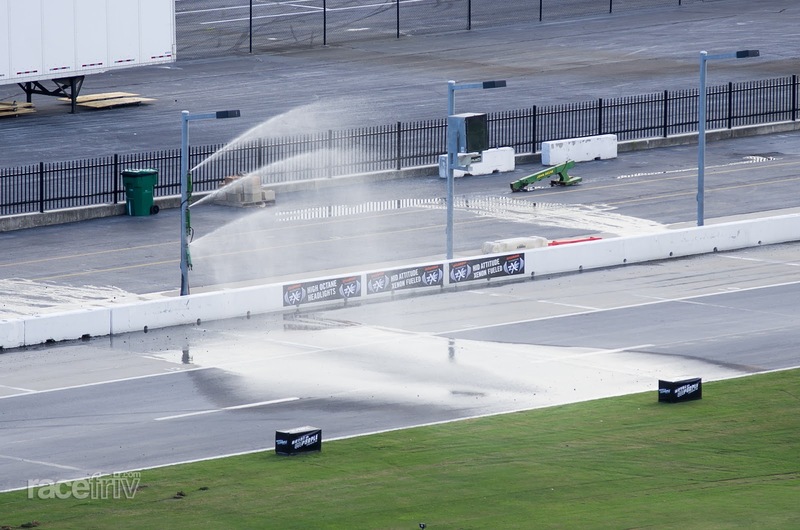 Liam Doran, Travis Pastrana and Rhys Millen were not here to race. 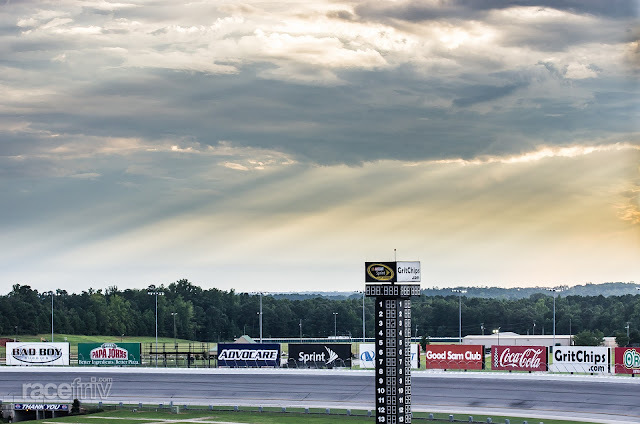 Which in my opinion is kinda odd, its going to be tuff to keep a professional series going when some peoples favorite drivers don't show up to a race. 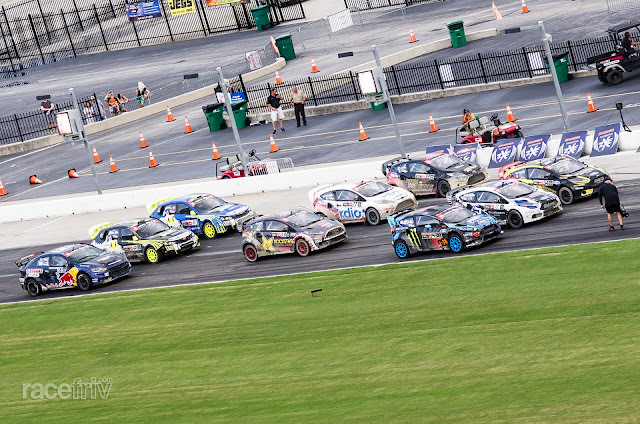 From left to right the final starting grid consisted of: Timur Timerzyanov, Dave Mirra, Sverre Isachsen, Brian Deegan, Scott Speed, Steve Arpin, Ken Block, Toomas Heikkinen then Tanner Foust. Kens car never left the grid when the final started. A blown exhaust manifold was to blame - probably melted by the insane anti-lag these cars run before launch. 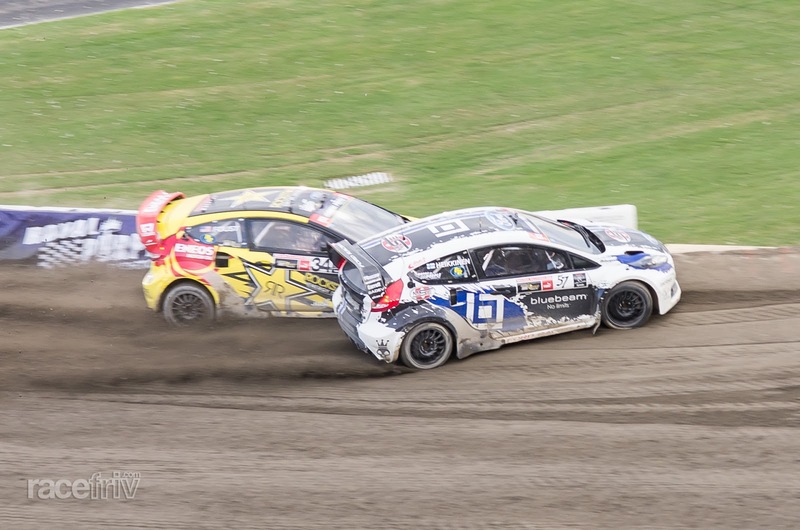 Tanner and Heikkinen fighting over the first corners in the dirt. For a moment we all thought Toomas was going to spin but he held on and led the race with a dominant drive. 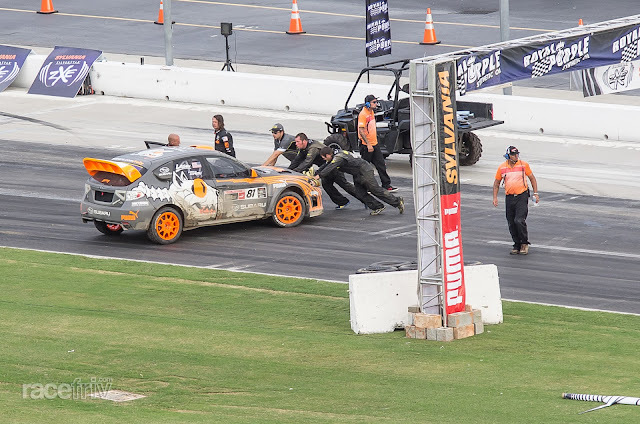 Steve Arpin dropped out on that first lap too, which left our Subaru drivers a couple of places higher than they started. They then had to battle with Scott Speed over 4th - 6th. 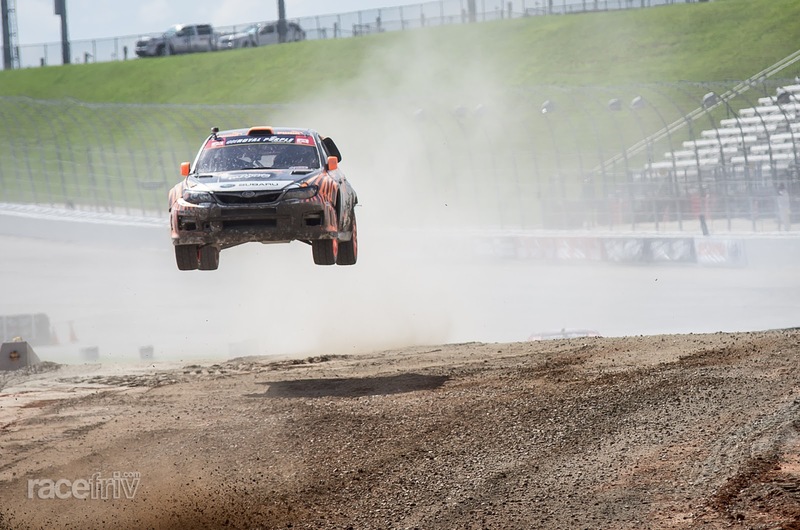 Scott and then Brian Deegan dropped out leaving Subaru in 3rd and 4th. Scott Speed (white) gets tangled up in Dave Mirra's car (black). Dave spun here and rejoined behind Sverre Isachsen (blue). Scott then dropped out soon after. Timurzyanov finished well back in his dodge but still completed the 10 laps, which was good going for a car that had been unreliable in the qualifying and the heats. Drivers did some donuts and jumping on the roofs to celebrate, a low key podium celebration followed along with some autograph signing. By that point I was worn out and didn't feel like fighting through the considerable crowd. I hope that Atlanta Motor Speedway and the organizers come back because I think we all really enjoyed it. They seemed to really underestimate how large the crowd was going to be. They can apply some lessons learned and who knows, maybe someday AMS will build a real infield circuit to be proud of. So until next time, stay frivolous.